Pune is the seventh largest metropolitan city in the Republic of India. It is also called as Poona. This city is generally called as the cultural capital of Maharashtra state. Puna city has a many reputed colleges/institutions which offer various engineering courses. Students from other cities & countries come here to pursue higher education. According to the census 2011, the average literacy rate of Pune is 86.15%. 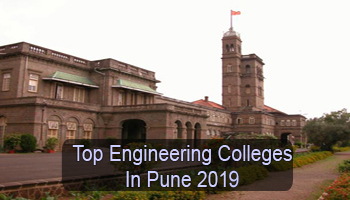 In this article, we have updated detailed information about Top Engineering Colleges in Pune 2019. We at sarvgyan.com listed top engineering colleges in Pune which imparts four-year B.Tech (Bachelor of Technology) programme in various specializations. The list is consisting of top government, deemed, public & private engineering colleges/universities. The rating is given to the listed colleges on the basis of several factors such as national importance & reputation, infrastructure, and facilities provided by colleges, faculty ratio per student, past placements, college affiliation, student’s preferences, etc. We have rated these colleges after a complete research & survey. The admission to the B.Tech & B.Arch courses will be done on the basis of the JEE Main exam. It is a national level exam organized by the NTA. Candidates will also get admission to the engineering courses on the basis of MH CET (State Level Exam). There are some famous universities which organize its own admission test to get admission into B.Tech programme such as Symbiosis SET, BVP CET, etc. Candidates who want to study M.Tech programme in Pune City, they have to apply for GATE examination. Candidates have an option to select any of the engineering specialization on the basis of scope & career. These specializations are Computer Science & Engineering, Mechanical Engineering, Electronics and Communication Engineering, Electrical Engineering, Automobile Engineering, etc. If you have any other queries about Top Engineering Colleges in Pune 2019, you can ask us by leaving your comments in the comment box. What about the PICT college? How it is left out? What will be the total budget for a year? Other state student can get adm.in govt collage at pune? which is the best engineering collage in pune?